Lucasfilm and Marvel announced today a new limited series of comic books titled Star Wars: Vader—Dark Visions. The series, which will debut in March 2019, will be written by Denis Hopeless (Cloak and Dagger) with art for the first issue by Paolo Villanelli (Lando: Double or Nothing) and art for the second issue by Brian Level (Thanos Legacy). The series will take a different point of view on Vader, presenting him as something of an "anti-hero". 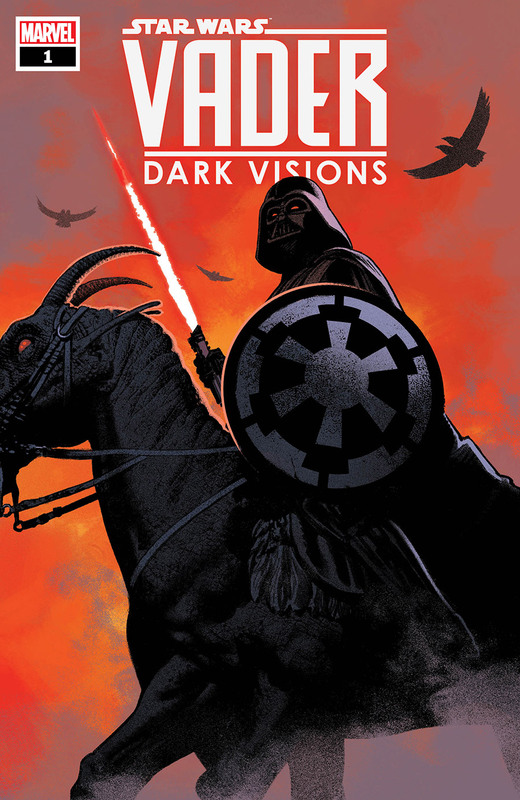 "Star Wars: Vader — Dark Visions will take readers to the darkest parts of the galaxy — places where the mysterious anti-hero known as Darth Vader can be someone’s greatest fear and even…someone’s greatest hope!" The series appears to be a replacement for Star Wars: Shadow of Vader, which was cancelled after author Chuck Wendig was unceremoniously fired by Marvel due to the subject matter and nature of his tweets (more on that here). That series would have dealt with how various people throughout the galaxy were impacted by Vader's life and legacy, while this new one appears to be taking the phrase "from a certain point of view" and running with it.